I couldn’t get a ticket for yesterday’s match so had to make do with watching it on the box, not quite the same but reckon the lads did great after the sending off. One thing I couldn’t believe (apart from the referee) was when Yohan Cabaye had golf balls thrown at him when he went to take a corner in the second-half. Almost equally as bad was the fact that, unless I totally missed it, the commentators made absolutely no reference to it. Nobody would claim our fans are all angels but that kind of backward behaviour should surely be left behind in the seventies, along with the darts that occasionally came flying your way when you were in the away end. I know we take the mick about the mackems being a bit backward but they didn’t have to try and live up to that tag in front of a TV audience, especially when actually having the golf balls inside the ground could only have been pre-meditated. 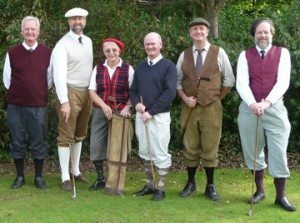 Unless of course they’d had a quick 18 holes on the Pennywell pitch and putt pre-match. So next match at St.James’ Park remember not to forget your season ticket, beer money and…..golf balls, or maybe not.